Two professional snooker players have been questioned by police over alleged irregular betting patterns. World number two Stephen Maguire, 28, and 33-year-old Jamie Burnett, both from Glasgow, were later released without charge by Strathclyde Police. The allegations relate to a match between the two players at the Maplin UK Championship on 14 December 2008. Police said a report would be submitted to the procurator fiscal's office when inquiries were complete. A spokesman said they had been questioned for about four hours before being released. 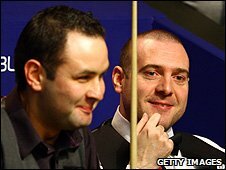 Stephen Maguire won his first round match against Jamie Burnett 9-3 at the Maplin UK Championship in Telford. Prior to the game, a number of bookmakers suspended betting after large amounts of money were placed on Maguire to win 9-3. After the game, the 33-year-old denied any wrongdoing and said he knew the situation and the pressure had affected his play. World Snooker launched a formal investigation and instructed specialist lawyers to help in the case. Strathclyde Police launched its own inquiry in April. Stephen Maguire turned professional in 1998 and is currently ranked second in the world. He has won four ranking tournaments - the European Open and UK Championship in 2004, the Northern Ireland Trophy in 2007 and the China Open in 2008. Jamie Burnett turned professional in 1992 and is currently ranked 40th in the world. His best performances in world ranking tournaments were reaching the quarter-finals of the German Open in 1997 and Grand Prix in 1998.